Rejection refers to the organ recipient's immune system recognizing a transplanted organ as foreign and mounting a response to it via cellular and/or humoral (antibody-mediated) mechanisms. Routine endomyocardial biopsy remains the criterion standard for monitoring for such rejection. This process involves sampling of the right ventricle using a bioptome, and a pathologist evaluating the tissue. The concept of rejection is not unique to cardiac allograft transplantation and, to a varying extent, occurs in all forms of solid organ transplantation. The first 2 images below show normal transplant endomyocardial specimens. Contrast these with the 3rd image which shows severe acute cell-mediated rejection, discussed below. 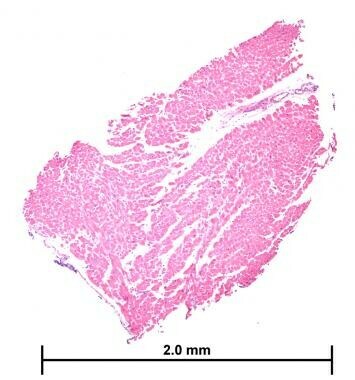 Transplant endomyocardial biopsy specimen from right ventricle. This photomicrograph is of one biopsy specimen with no evidence of rejection. (H&E, 40X). Severe acute cellular rejection. This photomicrograph exhibits diffuse myocardial inflammation with associated myocyte damage (ISHLT 1990 grade 3B or ISHLT 2004 grade 3R). (H&E, 100X). Cardiac transplant rejection manifests in 1 or more of the following 3 ways: acute cell-mediated rejection, antibody-mediated rejection (AMR), and allograft vasculopathy. Acute cell-mediated rejection is primarily a host T-lymphocyte-mediated response mounted against the allograft tissue. AMR refers to allograft injury resulting from activation of the complement system, typically by recipient-generated antibodies directed against the allograft tissue. Although AMR most commonly occurs months to years following transplantation, a rare subtype, hyperacute rejection, can occur within minutes to hours after transplantation. Cardiac allograft vasculopathy (CAV), also called accelerated graft arteriosclerosis, generally refers to concentric luminal narrowing of the epicardial and intramural coronary arteries. This process generally occurs months to years following transplantation and is currently the limiting factor in long-term allograft survival. This also is thought to represent a manifestation of an antibody-mediated response. Further details (ie, clinical, gross, microscopic findings) of these various types of rejection are detailed later in this article. Generally speaking, solid organ rejection is mediated via host T lymphocytes that recognize donor major histocompatibility complexes (MHC) I and II. The endothelium, being the primary interaction site between graft and host, is where rejection is usually first seen. Antibodies generated by these antigenic differences between donor and recipient as well as direct cytotoxic effects of the donor's immune system are responsible for the pathology seen in transplant rejection. A more detailed discussion of the basic immunologic mechanisms behind transplant rejection is beyond the scope of this review. For a detailed review of these processes, please see: Coico R, Sunshine G. Immunology: A Short Course. 6th ed. Hoboken, NJ: Wiley-Blackwell; 2009. The gross findings of transplant rejection are seen in 1 of 2 settings: the explant of a previously transplanted failing heart so that the recipient can receive another transplant or in the autopsy setting. The gross findings of these hearts are largely dependent on the type of underlying rejection. In hyperacute antibody-mediated rejection (AMR), the heart is generally swollen with a dusky appearance to the myocardium. Acute cell-mediated rejection can produce a spectrum of findings ranging from a grossly normal appearance to ischemic changes similar to that seen in hyperacute rejection. 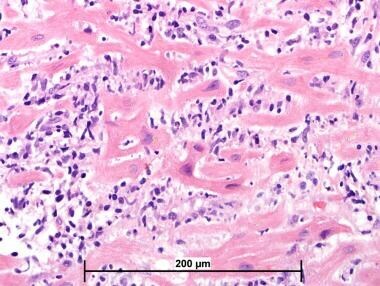 Perhaps the most common gross finding in transplanted hearts is that of cardiac allograft vasculopathy (CAV). This process manifests grossly as varying degrees of diffuse concentric luminal narrowing involving the entire length of the transplanted arterial vessels. This process, if severe enough, is often accompanied by chronic ischemic changes (ie, fibrosis) in the distribution of the involved vessels. 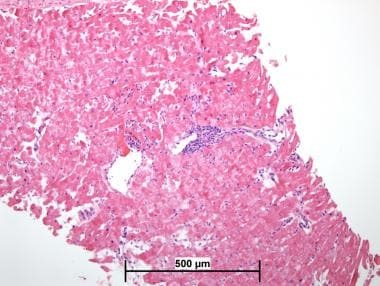 Regarding transplant endomyocardial biopsy specimens, the most important gross finding involves the assessment of specimen adequacy. Adequate sampling of the myocardium is essential to providing accurate information on the status of the transplanted heart to the clinical team. The International Society for Heart and Lung Transplantation working formulation (ISHLT 2004) of cardiac allograft pathology recommended an absolute minimum of 3 pieces (each of which contain >50% myocardium) of tissue be taken, primarily because of the focal and patchy distribution of acute cellular rejection. 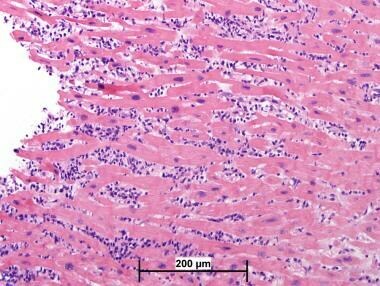 [9, 10] The current recommendation is evaluation of 4-6 pieces of transplant endomyocardial biopsy specimens when screening for rejection. 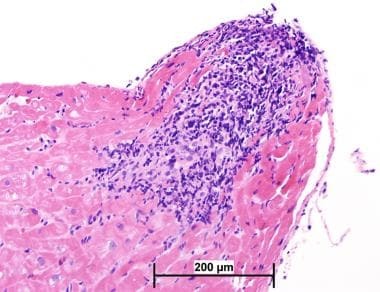 The histologic findings of acute cellular rejection, antibody-mediated rejection (AMR), and cardiac allograft vasculopathy (CAV) are reviewed in this section. Note that contraction bands are very common artifactual findings in endomyocardial biopsy specimens and should not be used as the sole criteria for a diagnosis of ischemia or myocardial tissue injury. Acute cell-mediated rejection is typified by a lymphocytic infiltrate that begins in a perivenular distribution and then progresses into the cardiac interstitium. The degree to which this infiltrate is present in these spaces is the primary basis for the grading of cardiac transplant rejection (see Tumor Spread and Staging). The lymphocytic infiltrate seen in rejection is primarily composed of T lymphocytes. This feature of rejection is useful when differentiating rejection from the so-called Quilty lesion (see the following image), which will contain both B lymphocytes and T lymphocytes, with the latter typically being more prominent. Quilty lesion. This photomicrograph shows a subendocardial Quilty lesion. This location, in concert with the interspersed capillaries and collagen among the lymphocytes, are classical features of a Quilty lesion. (H&E, 200X). Quilty lesions are an entity unique to cardiac allograft specimens and are found in 10-20% of transplant endomyocardial biopsies. They are defined as dense inflammatory foci that are generally seen in the endocardium of transplanted hearts. They may be large and sometimes extend deep into the myocardium, making them difficult to distinguish from rejection. Helpful distinguishing features of Quilty lesions are that they generally contain both B lymphocytes and T lymphocytes, they often have collagen between the lymphocytes, they often have capillaries near the middle of the infiltrate, and they can usually be found to connect up with the endocardium (see the image above). The etiology of this phenomenon is not known; however, some authors have suggested that it is related to post-transplant immunosuppression with cyclosporine A. More severe rejection is associated with a more pronounced infiltrate (which can include neutrophils and eosinophils), myocyte injury, hemorrhage, and/or vasculitis (see the images below). Although "myocyte injury" has not been precisely defined, histologically, some features should suggest such injury to the pathologist. They include sarcoplasmic scalloping, myocyte disruption, hypereosinophilia, and nuclear pyknosis. Severe acute cellular rejection. This photomicrograph exhibits diffuse myocardial inflammation with associated myocyte damage (ISHLT 1990 grade 3B or ISHLT 2004 grade 3R). (H&E, 200X). Severe acute cellular rejection. This photomicrograph exhibits diffuse myocardial inflammation with associated myocyte damage (ISHLT 1990 grade 3B or ISHLT 2004 grade 3R). Scalloping of the sarcolemma is readily apparent. (H&E, 400X). The ISHLT has revised the reporting structure for AMR.  } The pathologic diagnosis of AMR is now divided into those with histopathologic findings only (pAMR 1 (H+)), immunopathologic findings alone (pAMR 1 (I+)), both histopathologic and immunopathologic findings (pAMR 2), and severe findings of hemorrhage, capillary injury, and/or marked edema (pAMR 3). The luminal narrowing seen in cardiac graft vasculopathy is the result of concentric intimal hyperplasia within the epicardial coronary arteries and medial disease in the microvasculature. CAV has also been shown to have an association with intravascular thrombosis and may be a form of healed vasculitis. 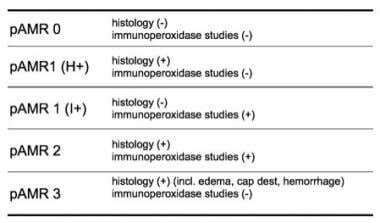 Immunoperoxidase studies for acute cellular rejection are useful in the identification of Quilty lesions and are critical in the diagnosis of antibody-mediated rejection (AMR). CD20 is helpful in identifying B lymphocytes in Quilty lesions that may be mistaken for cellular rejection, if their endocardial location is obscure. Cellular rejection is typically a T-lymphocyte-mediated response (see the first 3 images below), whereas Quilty lesions often contain numerous B lymphocytes as well as T lymphocytes, with a few macrophages (see the last image below). Immunochemistry for CD68 is helpful in diagnosing antibody-mediated rejection, which is characterized by intraluminal macrophages that may be difficult to identify on routine stains. In recent years, gene expression profiling (GEP) has been mentioned in the literature as a noninvasive means of monitoring for cardiac transplant rejection. This method involves obtaining a blood sample, and then, peripheral blood mononuclear cells are screened for gene expression patterns commonly seen in varying degrees of acute rejection. Despite the reported 84% sensitivity of this methodology, the specificity was 38%. Head-to-head studies with endomyocardial biopsies have yet to be performed. The first consensus statement on grading rejection in transplant endomyocardial biopsy specimens was published in 1990. It described the various histologic patterns of inflammation in biopsy specimens and is summarized in the image below. International Society for Heart Lung Transplantation (ISHLT) 1990 classification of acute cellular rejection in transplant endomyocardial biopsy specimens. Over the ensuing years, various issues with the 1990 classification scheme arose. Along with the advancement of immunosuppressive regimens and a drop in the incidence of acute cellular rejection, evidence grew that inconsistencies existed in the usage of the International Society of Heart Lung Transplantation (ISHLT) 1990 grading scheme. [11, 9] In 2004, task forces were gathered by the ISHLT to address these matters, and a revised consensus statement was published in early 2005. The ISHLT 2004 standardized cardiac biopsy grading for acute cellular rejection (see the summary in the first image below) modified the 1990 criteria in 3 major ways. First, ISHLT 1990 grades 1A, 1B, and 2 were merged into the revised ISHLT 2004 grade 1R (mild, acute cellular rejection). Second, ISHLT 1990 grade 3A was reclassified as ISHTL 2004 grade 2R (moderate, acute cellular rejection). Finally, ISHLT 1990 grades 3B and 4 were combined into ISHLT 2004 grade 3R (severe, acute cellular rejection) (see the second, third, and fourth images below). International Society for Heart Lung Transplantation (ISHLT) 2004 classification of acute cellular rejection in transplant endomyocardial biopsy specimens. Nearly 20 years after the adoption of the first standardized criteria, variability still exists in the way that rejection is reported. Although the ISHLT 2004 criteria is the most updated, its widespread adoption has yet to have occurred, with many institutions still reporting rejection using the ISHLT 1990 criteria. Some institutions have made the transition to using the ISHLT 2004 criteria, whereas others use a hybrid system, reporting both. The reason for this variability is likely due to the comfort level and familiarity of both the reporting pathologist and treating clinician with the different grading schemes. The ISHLT now recommends routine evaluation for AMR, beginning at least 2 weeks after graft placement. Likewise, the reporting scheme has been made formal with a detailed and descriptive grading rubric. Evaluating for the presence of AMR both histopathologically as well as with the assistance of immunohistochemistry is recommended. Histopathologic criteria for AMR includes, activated intravascular mononuclear cells within capillaries and venules, swelling of endothelial cells, and interstitial edema. Findings of hemorrhage, myocyte necrosis, capillary fragmentation, or intravascular thrombi may constitute a diagnosis of severe AMR. Immunopathologic surveillance for AMR is most commonly accomplished with antibodies directed against C4d and CD68. Strong reactivity of C4d with capillary endothelial cells in more than 50% of observed capillaries constitutes a positive C4d stain. See the image below. ISHLT 2013 Grading of Cardiac Transplant Biopsies for Antibody-Mediated Rejection (AMR). Although the overall prognosis following heart transplantation has markedly improved, a number of factors have been identified as portending a worse prognosis. People older than 55 years seem to do worse than younger people,  as do patients with diabetes. Underlying cardiac disease necessitating transplantation is also a factor that affects graft survival both in the long and short term. Veinot JP. Diagnostic endomyocardial biopsy--still useful after all these years. Can J Cardiol. 2009 Feb. 25(2):e55-6. [Medline]. [Full Text]. Patel JK, Kobashigawa JA. Improving survival during heart transplantation: diagnosis of antibody-mediated rejection and techniques for the prevention of graft injury. Future Cardiol. 2012 Jul. 8(4):623-35. [Medline]. Tan CD, Baldwin WM 3rd, Rodriguez ER. Update on cardiac transplantation pathology. Arch Pathol Lab Med. 2007 Aug. 131(8):1169-91. [Medline]. Taylor DO, Edwards LB, Aurora P, et al. Registry of the International Society for Heart and Lung Transplantation: twenty-fifth official adult heart transplant report--2008. J Heart Lung Transplant. 2008 Sep. 27(9):943-56. [Medline]. Hauptman PJ, Davis SF, Miller L, Yeung AC. The role of nonimmune risk factors in the development and progression of graft arteriosclerosis: preliminary insights from a multicenter intravascular ultrasound study. Multicenter Intravascular Ultrasound Transplant Study Group. J Heart Lung Transplant. 1995 Nov-Dec. 14(6 pt 2):S238-42. [Medline]. Wu GW, Kobashigawa JA, Fishbein MC, et al. Asymptomatic antibody-mediated rejection after heart transplantation predicts poor outcomes. J Heart Lung Transplant. 2009 May. 28(5):417-22. [Medline]. Marzoa-Rivas R, Perez-Alvarez L, Paniagua-Martin MJ, et al. Sudden cardiac death of two heart transplant patients with correctly functioning implantable cardioverter defibrillators. J Heart Lung Transplant. 2009 Apr. 28(4):412-4. [Medline]. Vaseghi M, Boyle NG, Kedia R, et al. Supraventricular tachycardia after orthotopic cardiac transplantation. J Am Coll Cardiol. 2008 Jun 10. 51(23):2241-9. [Medline]. Winters GL, McManus BM. Consistencies and controversies in the application of the International Society for Heart and Lung Transplantation working formulation for heart transplant biopsy specimens. Rapamycin Cardiac Rejection Treatment Trial Pathologists. J Heart Lung Transplant. 1996 Jul. 15(7):728-35. [Medline]. Mehra MR, Crespo-Leiro MG, Dipchand A, et al. International Society for Heart and Lung Transplantation working formulation of a standardized nomenclature for cardiac allograft vasculopathy-2010. J Heart Lung Transplant. 2010 Jul. 29(7):717-27. [Medline]. Stewart S, Fishbein MC, Snell GI, et al. Revision of the 1996 working formulation for the standardization of nomenclature in the diagnosis of lung rejection. J Heart Lung Transplant. 2007 Dec. 26(12):1229-42. [Medline]. Rose AG, Cooper DK. Venular thrombosis is the key event in the pathogenesis of antibody-mediated cardiac rejection. Xenotransplantation. 2000 Feb. 7(1):31-41. [Medline]. Berry GJ, Angelini A, Burke MM, Bruneval P, Fishbein MC, Hammond E, et al. The ISHLT working formulation for pathologic diagnosis of antibody-mediated rejection in heart transplantation: evolution and current status (2005-2011). J Heart Lung Transplant. 2011 Jun. 30(6):601-11. [Medline]. Tanaka H, Swanson SJ, Sukhova G, Schoen FJ, Libby P. Early proliferation of medial smooth muscle cells in coronary arteries of rabbit cardiac allografts during immunosuppression with cyclosporine A. Transplant Proc. 1995 Jun. 27(3):2062-5. [Medline]. Xu Y, Galambos C, Reyes-Múgica M, Miller SA, Zeevi A, Webber SA, et al. Utility of C4d immunostaining in the first year after pediatric and young adult heart transplantation. J Heart Lung Transplant. 2013 Jan. 32(1):92-7. [Medline]. [Full Text]. Hunt SA, Haddad F. The changing face of heart transplantation. J Am Coll Cardiol. 2008 Aug 19. 52(8):587-98. [Medline]. Healthcare Systems Bureau, Division of Transplantation. 2007 Annual Report of the US Organ Procurement and Transplantation Network and the Scientific Registry of Transplant Recipients: Transplant Data 1997-2006. 2008. Available at http://optn.transplant.hrsa.gov/news/newsDetail.asp?id=1075. Tjang YS, van der Heijden GJ, Tenderich G, Korfer R, Grobbee DE. Impact of recipient's age on heart transplantation outcome. Ann Thorac Surg. 2008 Jun. 85(6):2051-5. [Medline]. Higgins J, Pflugfelder PW, Kostuk WJ. Increased morbidity in diabetic cardiac transplant recipients. Can J Cardiol. 2009 Apr. 25(4):e125-9. [Medline]. [Full Text]. Mahle WT, Kanter KR, Vincent RN. Disparities in outcome for black patients after pediatric heart transplantation. J Pediatr. 2005 Dec. 147(6):739-43. [Medline]. Schweizer RT, Rovelli M, Palmeri D, Vossler E, Hull D, Bartus S. Noncompliance in organ transplant recipients. Transplantation. 1990 Feb. 49(2):374-7. [Medline]. Kfoury AG, Renlund DG, Snow GL, et al. A clinical correlation study of severity of antibody-mediated rejection and cardiovascular mortality in heart transplantation. J Heart Lung Transplant. 2009 Jan. 28(1):51-7. [Medline]. Rose AG, Cooper DK. 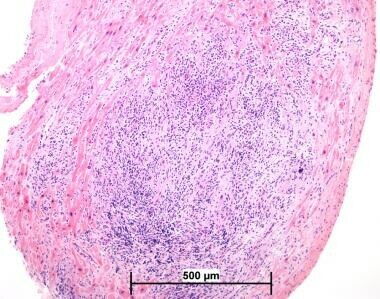 A histopathologic grading system of hyperacute (humoral, antibody-mediated) cardiac xenograft and allograft rejection. J Heart Lung Transplant. 1996 Aug. 15(8):804-17. [Medline].